As a research campus designated to help accommodate California’s “tidal wave two” of students, the University of California at Davis faces continually expanding enrollment. 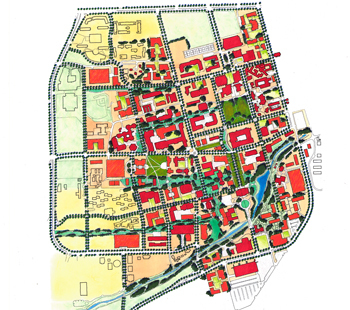 This study identified potential capacity in the core campus to accommodate up to an additional two million gross square feet of additional development. The study addressed the need for physical expansion by establishing a design framework of characteristics emblematic of the university culture of place. Through a network of boulevards and garden walks, the study provides for the needs of both pedestrians and bicyclists throughout the core campus. New buildings, with height and alignment restrictions related to context buildings, reinforce campus-wide and district open spaces. North-south circulation elements link to the campus arboretum, a significant landscape element of the institution’s history. The university used the results of this study to guide the “demand” side for instructional and research programs and to update the campus Long Range Development Plan.